ARLINGTON, Va. (RNS) -- Seated at a table with other chaplains who have comforted grieving military families, retired Army Chaplain John Schumacher held the red rose in his hands before he passed it along, pausing to remember those who had died on the battlefield. 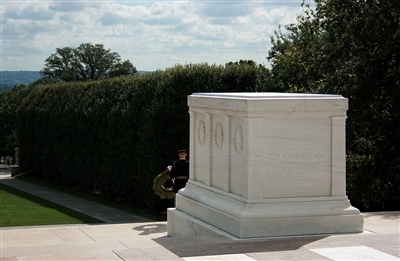 Retired Chaplain John Schumacher found comfort in placing a wreath at the Tomb of the Unknown Soldier in Arlington Cemetery. Photo by Navin75 via Creative Commons. “I’ve been in combat. I’ve been with a lot of wounded men. I’ve been with dead men who were my friends,” said Schumacher, a two-tour Vietnam veteran. Rev. Valerie Storms, president of the Association of Professional Chaplains, said many chaplains’ organizations, including Catholic and Jewish groups, tell chaplains to take care of themselves as well as others. Self-care ranges from knowing a chaplain they can contact on the spur of the moment to developing hobbies — from running to making jewelry — to maintain their spiritual and emotional equilibrium. Storms, who is affiliated with the Alliance of Baptists, tends to her garden to help her through tough days as the manager of chaplaincy care at Moffitt Cancer Center in Tampa, Fla. 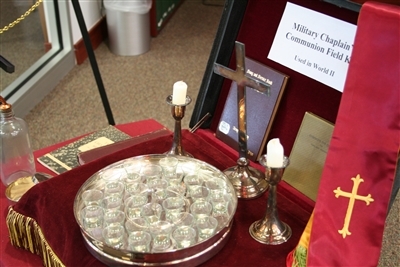 This totable communion set, which belonged to a Methodist chaplain serving in World War II, is on exhibit at the Thrift Florida United Methodist Heritage Center at Florida Southern College. It serves as a reminder of the stresses faced by those whose mission is to comfort others. Photo by Susan Green. Gumminger is developing a workshop to help hospice chaplains. Others are working to help chaplains recognize and improve the ways they deal with grief. Later this year, the U.S. Army Chaplain Center and School in South Carolina will introduce a new training session developed by the University of Georgia that includes “secondary traumatic stress” among chaplains and grief counselors. The Army’s chief of chaplains has encouraged a “Care to Caregiver” initiative that matches retired chaplains to serve as mentors to younger chaplains. Chaplain Milton Johnson, a soldier and family minister at Fort Sam Houston in San Antonio, said he relies on fellow chaplains, his wife and pastors of his Seventh-day Adventist denomination to help him channel his grief — including when he lost his running buddy to suicide. But he said the new initiatives put a sharper focus on the need for chaplains to get help as they suffer along with their comrades. Chaplains need to heed the lesson taught by flight attendants who warn airline passengers to put a flotation device on themselves before others, he said. Katie McNichol Sirmons, a Florida Conference Connectional Relations staff member who spent five months as a clinical pastoral intern in a full-service Tampa hospital last year, said she got a close look at the daily demands on chaplains. "Chaplains get a glimpse at the fullness of the human condition, and it can be heartbreaking," she said. "Self-care is paramount in a job where each call can be a surprise, but where you must also be deeply present for others who may be experiencing unfathomable pain." Among the lessons she learned from the hospital's veteran chaplains was the importance of developing ways -- through prayer, song or reading scriptures -- to find some measure of peace in the hectic, often tragic, hospital environment. "As someone who has prayed with loving mothers losing a child and with others about to give birth, I fully subscribe to the existence of holy tears," Sirmons said. "Chaplains arrive at someone’s side and create space for them to name or express their emotions, to validate their experience, whatever it looks like for them. That’s why chaplains are so helpful to one another. " Chaplain Robert A. Miller, an instructor at the U.S. Army Medical Department Center and School in San Antonio, recalled a 2012 remembrance ceremony for 9/11 on a Kuwait City beach, where chaplains and other soldiers were given carnations, told to recall those they had served and lost, and watch their flowers drift away into the surf. Rev. Steven Spidell has measured some of that toll. In a 2009 survey, he found that one-fifth of health care chaplains reported “disenfranchised grief,” or grief that was not supported in the workplace. Such an episode leaves him “physically and emotionally exhausted” and sometimes it takes days for him to admit how tough it was. But he said he is grateful for the time he spends with a family, which moves on to a funeral without him. * From Religion News Service. Florida Conference Connection contributed to this article.